Main draw places at stake in the Men’s Singles event at the 2018 ITTF Challenge DPR Korea (Pyongyang) Open; as the qualification tournament came to a close, on Thursday 14th June, the host nation’s Ro Kwang Jin and Kim Song Gun reserved their positions in some style, they completed their group matches unbeaten. Likewise, their colleague, An Ji Song, secured top spot in his group but life was more treacherous. Ro Kwang Jin concluded his initial phase contests with victory over China’s He Ziquin; Kim Song Gun beat Mongolia’s Erdenebayer Chinbat (11-5, 11-5, 11-4, 11-7) followed by success in opposition to Zhu Shusheng, like He Ziqian from China (7-11, 11-7, 8-11, 6-11, 11-4, 11-7, 11-4). Somewhat differently for An Ji Song, after overcoming Ro Hyon Song in four straight games (11-7, 11-7, 11-7, 11-7), he lost to China’s Liu Yebo in seven games (11-8, 11-7, 12-10, 10-12, 9-11, 12-14, 11-7). 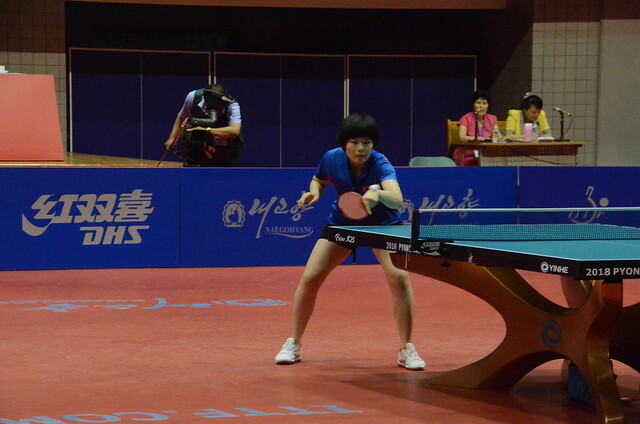 However, the previous day Ro Hyon Song had beaten Liu Yebo in six games (11-8, 7-11, 5-11, 11-6, 11-9, 13-11). Thus games ratio was needed to determine the outcome; An Ji Song (7:4) finished in first place, ahead of Liu Yebo (6:7) and Ro Hyon Song (4:6). Meanwhile, in the remaining groups, DPR Korea’s Ri Kwang Myong alongside China’s Ji Jiale and Cao Wei completed their group phase matches without defeat. Ri Kwang Myong beat Iran’s Miad Lotfijanabadi (11-6, 11-1, 9-11, 11-4, 9-11, 11-5), before accounting for China’s Ji Ruilong (12-10, 11-5, 11-4, 11-9); Ji Jiale overcame Vietnam’s Nguyen Duc Tuan (11-7, 11-6, 11-5, 11-6) and the host nation’s Ham Yu Song (4-11, 9-11, 11-9, 5-11, 14-12, 11-6). In a similar vein, not to be outdone, Cao Wei beat both Doan Ba Tuan Anh, like Nguyen Duc Tran from Vietnam (11-5, 11-8, 11-3, 11-4) and DPR Korea’s Hwang Chung Nam (11-6, 15-13, 7-11, 11-9, 11-1). Notable performances to secure first places, from Liu Yebo and Nguyen Duc Tran facing host nation adversaries, it was the same in the Under 21 Men’s Singles event. Liu Yebo beat Kim Song Gun (11-5, 11-5, 5-11, 11-6); Nguyen Duc Tran overcame Kim Kuk Chol (11-6, 11-2, 11-6). Play in the main tournament commences on Friday 15th June.